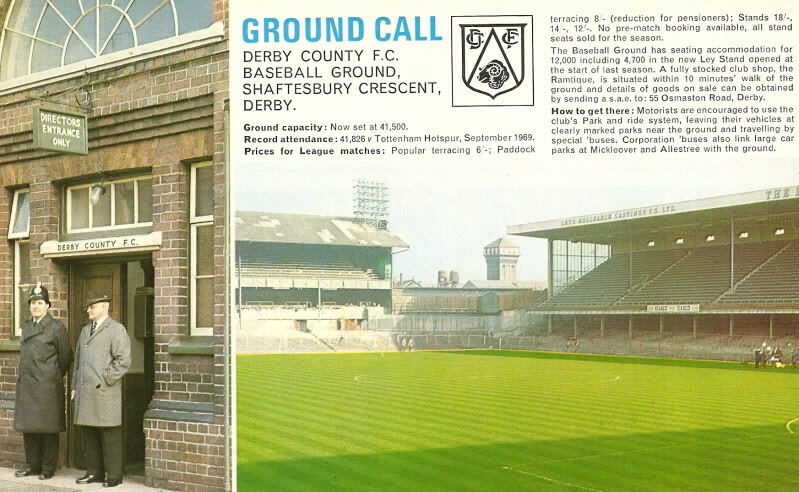 The Baseball Ground (known then as Leys Baseball Ground) was first used for baseball from 1890 till 1898 and hosted both football and baseball from 1895 when Derby County moved in to share it, the football club remained there till 1997. The stadium had an unusual design with two 3-tier stands at either end, it was unusual in as much that the lower tiers did not face completely straight towards the pitch, this was due to the previous configuration being set up for baseball. The picture below was taken from a Football Review magazine in the early 1970’s. "The Baseball Ground has seating accommodation for 12,000 including 4,700 in the new Ley Stand opened at the start of last season. A fully stocked club shop, the Ramtique, is situated within 10 minutes walk of the ground and details of goods on sale can be obtained by sending a s.a.e. to 55 Osmaston Road, Derby"